Fish tank? Nah... Kitty pool! Oh my groceries! Too funny. I don't think I will ever try to set up a fish tank with Oberon in the house. 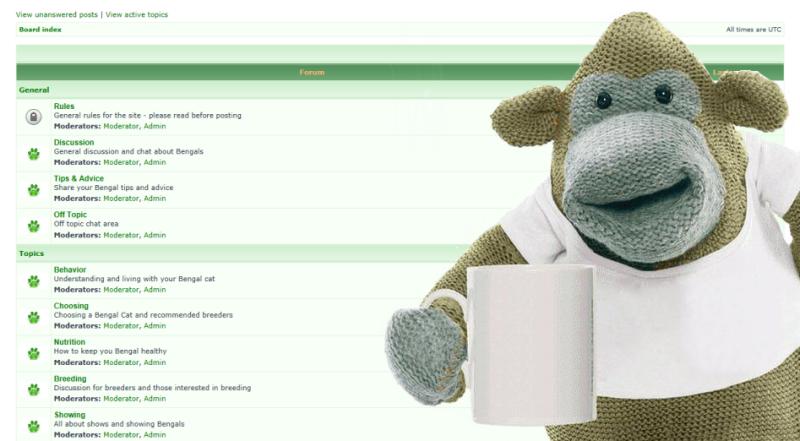 Do your fish know they've been gazumped yet? lol I got about 5 gallons into that tank and she jumped right in and I let her have her fun for awhile pawing at the water. She hopped in the shower with me once before too, no privacy! 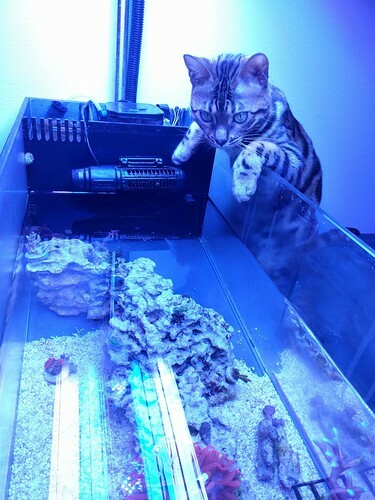 We have a fish tank downstairs already, she loves it! She is right there as soon as I am doing anything with the tank and spends a fair amount of time curled up on the couch watching 'tv'. She does dip her paws in the water but so far no fish has become dinner although she bats at them a lot. 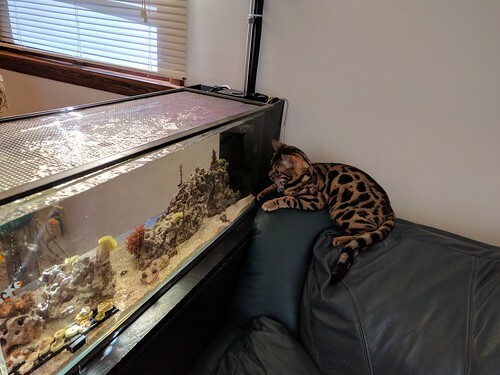 Our other Bengal Onyx doesn't care about the fish tank but we had hamsters many years ago he loved to watch. Sometimes I consider getting some feeder mice to put in a glass cage so Onyx can enjoy his rodent TV again. It would be a win for the mice too since they would not be anyone's dinner. lol, I meant mice to just watch, not to actually touch/play with the mice. 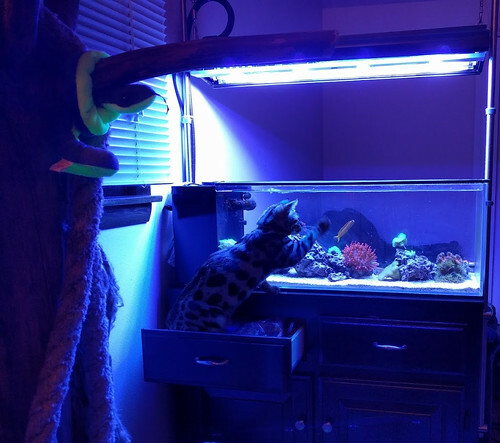 I do like fish, or rather salt water reef tanks with live coral and all that jazz :) It is definitely a full house with a dog, cats, and fish! Wow, very nice setup! And great for cats. Cat TV indeed. 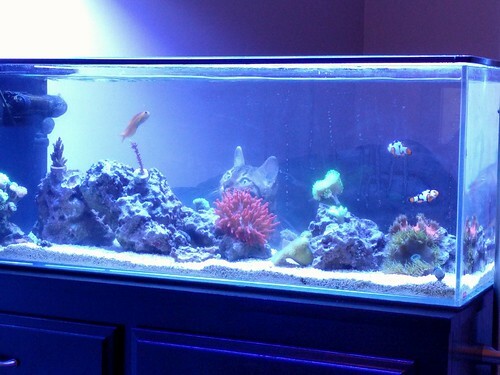 I love looking at other people's fish tanks. I would love to have one, but not the feeding and maintenance part of it. When I upgraded my 75 to a 120 the first occupant was my old cat. I had a picture of the catfish somewhere, couldn’t even wait for water. Mine has a sump so that’s the tank I have to watch for more since it’s ground level.